This morning's worship service was definitely a unique experience. The church we have attended the last two weeks meets in a grove of eucalyptus trees. The leaves are all above and we have plastic chairs set up for people to sit. This arrangement works fine during the dry season, but the rains have just begun. This morning, since it was obviously overcast, the pastor explained the plan for when it rains. The children all go into the building for children's church and the adults all go stand in the other building for the remainder of the service. While we were singing our second worship song, the rain began. After getting our children to their building we walked into the other building with the adults. There were over one hundred of us all standing side by side in a room that is a little larger than our living room back in the states. We continued our worship all standing very close in this room. It felt a bit like an early church worship experience, standing there for over an hour and a half; standing to sing worship songs, standing in small groups to pray with those in need, standing to hear the Word preached, and standing to sing more praise. It was very good and encouraging to me to be a part of this time of worship! I have been struggling lately with fear regarding the pre-cancerous area on my tongue. Since I can always feel this area of dysplasia, it is an ongoing battle in my mind to trust that God has my future in His hands. I have had several moments lately of feeling my blood pressure rise as I become fearful. I even considered staying home from worship today since I was a bit overwhelmed by these fears last night and this morning. But it occurred to me that worshipping with God was probably just what I needed. "Our God is greater, our God is stronger, God you are higher than any other. Our God is Healer, awesome in power Our God." With me in the storm. With me at the dawn. You work everything for good. I will trust my God who is the Healer, who is awesome in power, who is working everything for good. The pieces of my life are in His hands! I'm sorry that I do not have a photo to share of this worship time, but I hope my description gave you a mental picture of it. 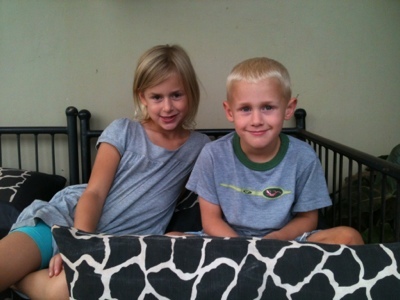 Instead I will just include a picture of some of my kids sitting on the back verranda. Thank you for sharing! Those words are beautiful and so comforting. I can only imagine your church scene...amazing. Also, Esther looks so grown up in this picture! !